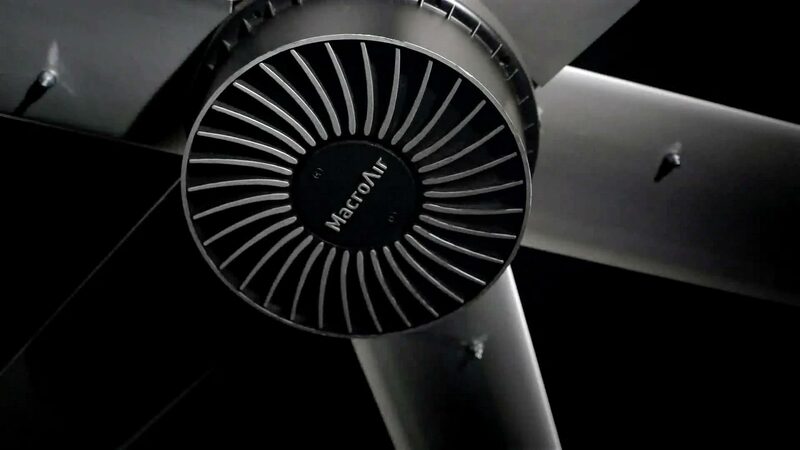 MacroAir was the first to invent the HVLS (high-volume, low-speed) fan, the first to introduce a 6-blade design, the first to run HVLS fans in reverse, and the first to engineer the most lightweight, energy-efficient, and powerful direct-drive HVLS fan. MacroAir strives to continually push boundaries and set the bar when it comes to engineering the HVLS fan. Their premium fan line, AirVolution-D, is on the leading edge of technology, simplicity, and reliability. AirVolution-D is powered by a breakthrough in motor technology called D-Drive. Although direct-drive motors are commonly used in other industries, AirVolution-D has the only gearless direct-drive motor capable of handling the consistent torque requirements of a 24-foot diameter industrial ceiling fan. MacroAir is dedicated to innovating and perfecting the world’s most cost-effective climate control solution. Their products are unparalleled in energy efficiency and effectiveness and are assembled in the USA and installed worldwide. Customers benefit from local service and highly customized solutions from MacroAir’s global distributor network. MacroAir fans are trusted by companies such as Coca-Cola, CSX Transportation and NAPA Auto Parts. The company is the exclusive HVLS fan supplier for independent auto dealerships of BMW, Chrysler, Ford, General Motors, Lexus, Mercedes-Benz, Nissan and Toyota under their Dealer Equipment Programs. We can Powder coat your fan to match your design.